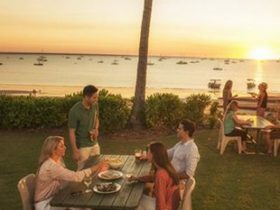 Darwin, the Northern Territory’s vibrant capital, is a city with influences that are as much Asian as they are western. 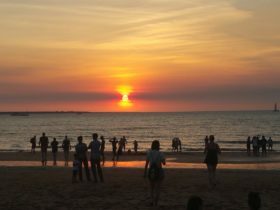 A city with dozens of nationalities sharing an easy-going lifestyle, Darwin is located on a peninsular with the sea on three sides. It is a place unvisited by winter where the weather can usually be described as either balmy or sultry. Darwin is well appointed, possessing most of the amenities expected of a much larger city. Watching sunsets and storms are something of a local pastime, and after a cleansing rain shower you can almost hear things growing. An hour south of Darwin is Berry Springs Nature Park, a swimming and recreational area and the popular Territory Wildlife Park is just next door. Operating on the nearby Adelaide River, regular jumping crocodile cruises provide the chance to see saltwater crocodiles propel themselves from the water. Further south along the Stuart Highway is Litchfield National Park, a great place to cool off beneath cascading waterfalls and view attractions such as unique magnetic termite mounds, monsoonal rainforests and tumbling rocky waterholes. To the north of Darwin are the Tiwi Islands where visitors can share in the culture of the Tiwi people. Take an organised tour and purchase some local art and crafts, chat with some of the local Tiwi ladies over a pot of billy tea, or fish the clear waters surrounding the islands. The Darwin area is a local government area (LGA) in Northern Territory. This area is home to 40 locations and/or suburbs which you can explore in more detail by selecting from the list below. The Darwin area is located approximately kms from the capital Darwin.